Danna Horton is a partner in the Real Estate practice. Danna focuses her practice on sophisticated commercial real estate transactions and financial services. She represents lenders, borrowers, private equity funds, real estate investment trusts (REITs), national developers, landlords and tenants. Danna counsels lenders and borrowers in all types of real estate finance transactions, including first mortgage loans, mezzanine loans, construction loans, loan sales and other structured financings. She advises investors and operators in real estate joint ventures, acquisitions and dispositions. She also advises clients on long-term ground leases, sale-leasebacks and space leases. 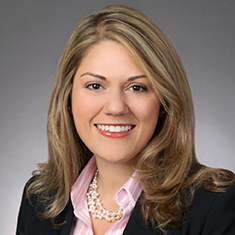 In addition, Danna represents community and philanthropic organizations in pro bono matters. While attending law school, Danna served as an editor for the University of Illinois Law Review. Shown below is a selection of Danna’s engagements. Representation of a public company client in its first acquisition, following its initial public offering, of two new, Class A multifamily projects located on Hollywood Boulevard in Los Angeles, California. Representation of a public company client in connection with the acquisition, and simultaneous origination of a 99-year ground lease, of 13 acres of vacant land for construction of medical office buildings in Forsyth, Georgia. Representation of an institutional investor in its acquisition of a long-term lease for a hotel in San Antonio, Texas, together with the creation of a second long-term lease for the street retail on the first floor underneath the hotel. Representation of a ground landlord in connection with the acquisition, and simultaneous origination of a 99-year ground lease, of a 7-story office building on 1.83 acres on Peachtree Street in Midtown Atlanta; representation in related joint venture agreement. Representation of a public company client in connection with the acquisition, and simultaneous origination of a 99-year ground lease, of two office buildings in Cary, North Carolina. Representation in connection with the sale of the leasehold interests, and simultaneous origination of a 99-year ground lease, of two properties originally leased to a food supplier and distributor in Miami, Florida. Representation of a mezzanine lender in financing the renovation of the former Cook County Hospital building in Chicago. Representation of a bank in its construction loan for a mixed-use retail and multifamily building in Logan Square in Chicago. Representation of three ground landlords as borrower in fee financings for properties in Washington, DC, and Nashville, Tennessee. Representation of a REIT as borrower in connection with its mezzanine loan for the Ace Hotel in Brooklyn. Representation of a seller of a marina, operating business and real estate in Naples, Florida. Representation of a real estate client in connection with the sale of a multifamily apartment building near Florida State University in Tallahassee, Florida. Representation of an investment advisory services firm in its disposition of a multifamily apartment complex in the Chicago suburbs for approximately $80 million. Representation of a corporate client in the acquisition and construction of a manufacturing facility in Lockport, Illinois.